We may have been looking for answers in all the wrong places. Despite intensified searches for the genetic roots of a range of neurological disorders, such as autism and schizophrenia, scientists have, as yet, identified few risk factors — and no direct causal genes. Risk factor genes that have been discovered often link back only to subgroups of affected people, not to every person with the disorder in question. And scientists have know that if a mutation was the origin of a neurological disorder, that mutation would likely be difficult to track. Major mutations that are inheritable and cause disease directly are less likely to be transmitted from generation to generation. This has led researchers to wonder: where are the risk factors for neurological disorders hiding? , a group whose goal is to explore this diversity with the aim of connecting various mutations within neurons to associated neurological disorders. At this point researchers know that mosaicism is common, and that there may be thousands of changes to the genetic code within human neurons. Errors during DNA replication are the main factor causing somatic mutations, and the original neurons that eventually divide into a mature human brain divide billions of times, so there are ample opportunities for tiny errors in replication — any of which may be a factor in a neurological disorder. Mature neurons live much longer than other cells in the body, so the somatic mutations in the neurons are much more likely to affect health. Researchers may not have found the genetic source of psychiatric diseases in the past because they were looking in the wrong place — the germ cells. Instead, it’s possible that the DNA responsible for these neurological disorders is inside only the neurons, unseen by sequencing and undetectable before now. 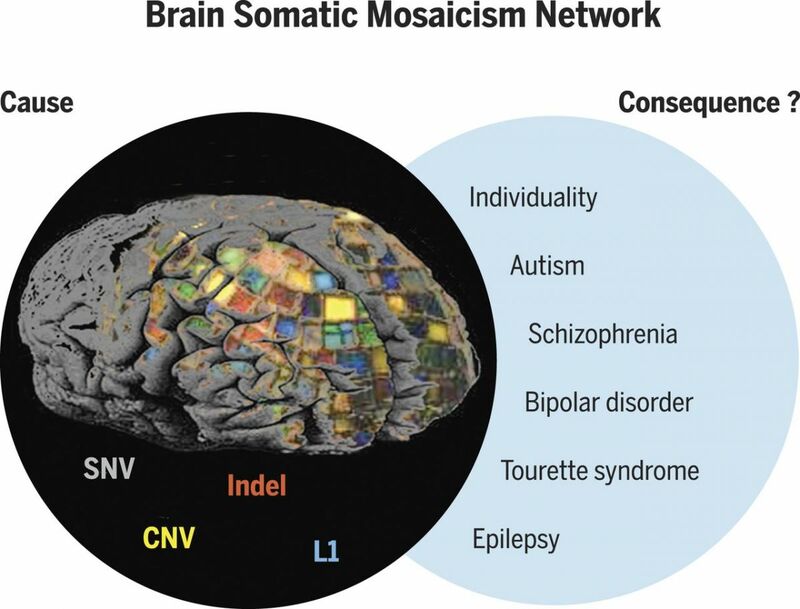 Researchers believe that learning more about somatic mosaicism might be the answer to understanding not only neural diversity, but human diversity more generally. The next important milestone for the BSMN will be the genome sequencing of individual neurons. The group expects to have data from at least 10,000 sequences by 2020.